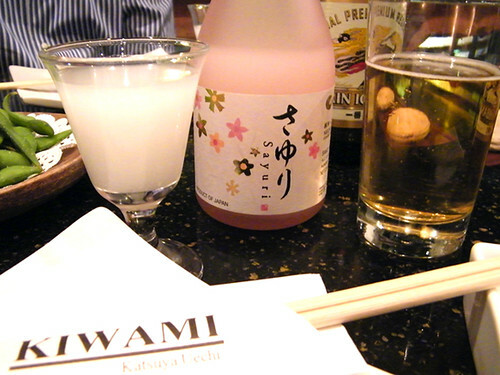 Katsuya Uechi’s new restaurant is called Kiwami. 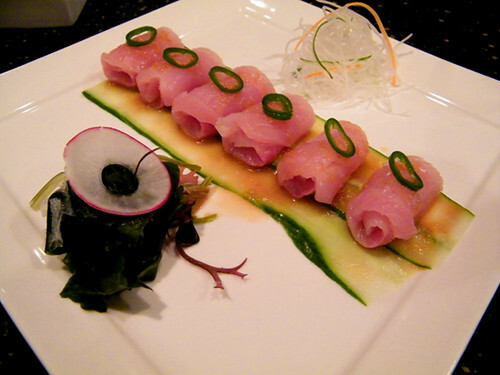 It’s just a few blocks away from Katsuya (our usual sushi joint on “sushi row”), and it’s also owned by Katsuya Uechi. 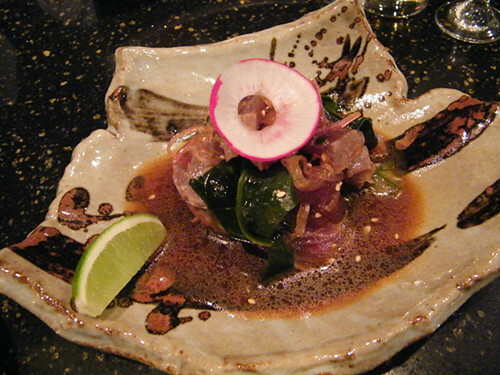 For our first visit to Kiwami, my husband Peter and I sat at a table so I could capture photos easier. Well, at least easier than sitting at the intimate sushi bar helmed by Chef Uechi himself! Our charming server, Hugh, explained that Kiwami is more “upscale” then Katsuya restaurant, and this was definitely reflected in the ambiance and decor. I’ve worn flip-flops and shorts to Katsuya, but that would be way too casual for a meal at Kiwami. We ordered mostly from the “Today’s Specials” menu and loved every bite. Kiwami translated, means “doing something extremely” or “the best degree in Japanese”, and Chef Uechi definitely delivers the kiwami to this soon-to-be super hot sushi spot! Sayuri, our favorite unfiltered sake. Born in Okinawa (like me! 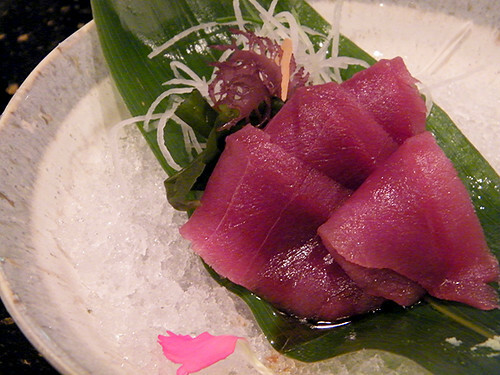 ), Japan, Chef Katsuya Uechi began his career as a chef at the Harbor View Hotel in Okinawa. 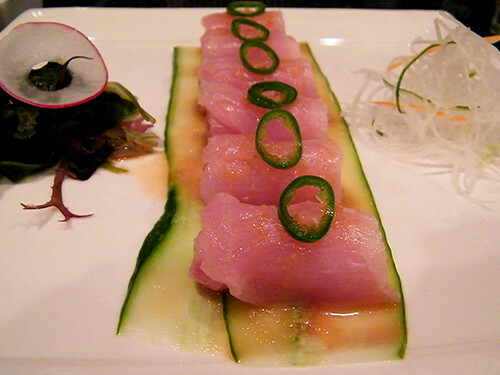 He moved to Los Angeles over 20 years ago and opened the Studio City Sushi Katsu-Ya in 1997. Tempura & Trout are one of my top favorite food!! 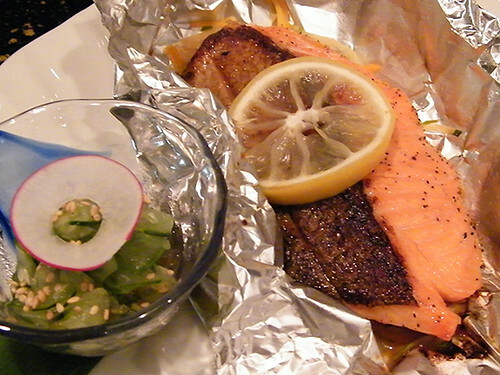 This Tempura & Tasmanian Trout looks absolutely delicious! Almost, indeed. Great post, Jo. I almost feel like I was there. I just wanted to say that I really enjoy reading about all of your culinary adventures. 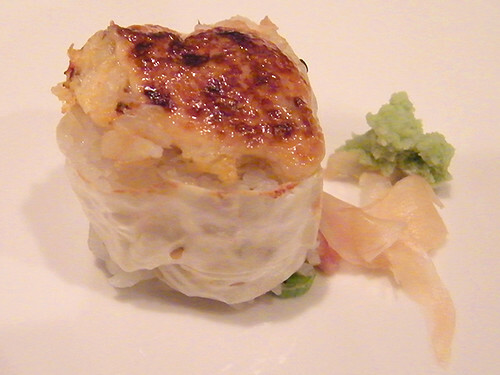 These amazing photos have made Kiwami my next sushi visit. Thanks for sharing and can i say that i love your writing style and point of view and what can i say about the great photos…they’re awesome! hmm… so Katsu-san is going back to his roots? like. ACTUAL sushi? no kidding? I thought about something today after reading this, and had to comment again. So I apologize for the double post. I wonder if sushi is a metaphor for how we all should eat, and that perhaps it’s Japan’s way of trying to teach us something about how we should always approach our food. We should eat the freshest things possible, don’t cook the hell out of it, and as a result live a long, healthy, happy life. My point is that the freshness of this food is the attraction. You can’t look at this and say “That looks bad for you.” On the contrary, it looks very good for you (save for the fried stuff, but you have to live it up – right?). All of our meals should be fresh like this. I can’t wait to try this place! The food looks so beautiful and delicious. Thanks for the review. Was it really crowded? 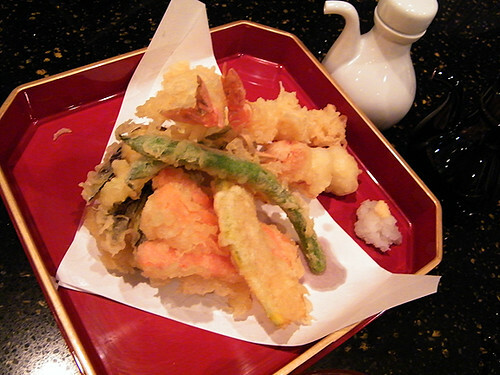 the tempura was so light and crispy! I agree about the simplicity of Japanese food, especially when I think of the food that came from my grandmother’s kitchen. When I was little (and was living in Okinawa), my oba-chan (grandma) used to make steamed salmon, purple potatoes and we’d eat it with rice. She lived until she was 100 years old! It was nice to see Chef Uechi at the sushi bar (even though we didn’t sit there!). 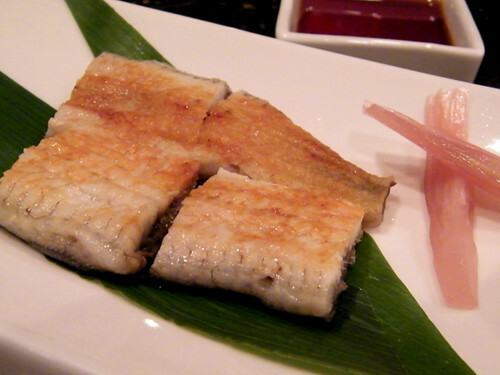 The restaurant was crowded, but not like Katsuya… The Kiwami dining room has a very open layout with fewer tables. Very elegant and I sorted wanted to whisper the whole time!